It gives me great pleasure to announce that I was nominated for a Liebster Award! What’s a Liebster Award you ask? 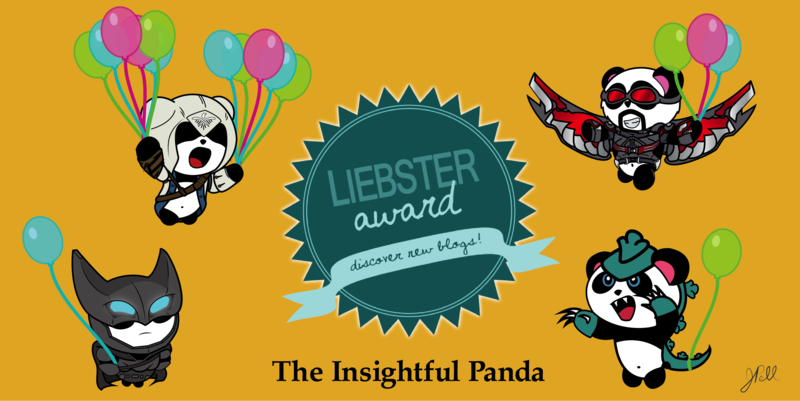 Well a Liebster Award is an award for bloggers by bloggers and is meant to raise awareness of outstanding blogs that have fewer than 1,000 followers! Now some might not see this as a big deal, but for me I am tremendously honored that I – a simple panda – am starting to get noticed. What makes me feel even more special is that I was nominated by Susan Spilecki from Building A Poem, who just so happens to be a Professor of Communications & Writing at MIT and Northeastern University! Display the award (icon seen below) on your blog–by including it in your post and/or displaying it using a “widget” or a “gadget”. What is your favorite book to reread? I don’t get as much time to read as I’d like to, so I usually try to read new things whenever I get the chance. If you could be any hero, who would you be? There are so many heroes I love and admire – comic, film, video game, anime. Can I make up my own hero? If not, then I actually choose Goku from Dragonball Z. I really want to fly and he always smiles no matter how hard things get. What is the hardest part of writing for you? Keeping up. When I first started I wondered WHAT I would write. Now I have so much to write that I wish there was a way for me to write faster – or multitask write while doing something else. How do you avoid writer’s block? I’ll let you know when I figure it out. Lol For now, I walk away, do something else and inspiration usually strikes. What movie would you watch if you were feeling down? Either Tangled or ANY Mel Brooks movie! Robin Hood: Men in Tights, History of the World, To Be Or Not To Be, High Anxiety, etc, etc. The man is a genius! Do you speak/read a second language? Which one? Does Latin count – probably not. In the past few years I’ve tried to pick up German and Italian; but put them off for one reason or another. Though I plan on picking up Italian again soon. What do you like best about blogging? I love it when people Like, Share and Comment upon my stuff because it really makes me feel like I’m making a difference. Captain America or Ironman? Wow, way to start a Civil War Susan lol I love Ironman and would LOVE to “borrow” one of his suits; but at the end of the day you have to love Captain America. He represents pure good and isn’t afraid to fight against evil in any form. I feel like we can use heroes like that, especially today. What is your favorite summer drink?. Strongbow Honey Apple Cider! The perfect balance of refreshing and yet not overly sweet. What weird writing rituals do you have, if any? Sometimes if I can’t focus, I have a 5 minute dance party and then get back to writing. I grew up preferring DC thanks to Bruce Timm’s animated universe, but then preferred Marvel once their Cinematic Universe got underway. Now, thanks to The Flash and Daredevil, I love both DC and Marvel equally. I like to Cosplay and plan on doing it a lot more! My favorite series of all time is Full Metal Alchemist: Brotherhood. It was the first show I ever took the time to analyze and one day I want to do an article series about all of it. If someone starts playing 80s/early 90s Dance Hits, I WILL start dancing. I can’t help it. At the time of this nomination, I am reading Aziz Ansari’s Modern Romance, and it is glorious! I still have an old N64 and will challenge ANYONE to a game of Super Smash Bros and Goldeneye. I love to play YuGiOh and talk strategy. The more I think about it – and watch shows about it – the more I realize Time Travel is a TERRIBLE idea. If you could travel to any time period – but NOT affect anything – which would you choose? If you could get a sequel to ANY film, which would you choose? What are you a ‘nerd’ about – comics, tv, fashion, etc – we all have at least one! Who is your hero/aspire to be like? ← Analysis of Spectre Trailer – Deceit, Easter Eggs & A Foreboding Cliffhanger? 1. There are a ton of good shows on, so I’ll go with current shows and pick You’re the Worst on FX: a series about two cynics who abhor traditional romance, don’t like terms like relationships or dating, and are toxic for most people but each other. It’s couples’ therapy, in my opinion, but also takes the romantic comedy genre, turns it on its side, and exposes the flaws that come with relationships. 2. Telepathy. Another hard ones since there are good choices like speed, flight, telekinesis, elemental powers, strength and such, but I think the ability to influence or make others believe or see what you conjure up could be very powerful as well. 3. Why? Well, I majored in journalism and have always enjoyed television and films, but never had an outlet for expressing my thoughts. I still don’t since I consider my blog to be highly amateur, but it’s a good way to get practice at writing my thoughts on what I enjoy, giving myself deadlines to stay on track, and try my hand at analyzing programs for themes, messages, and characterization. That and for all the talk people do of saying they have opinions about things, now I can actually put my money where my mouth is and see if I have what it takes to actually write consistently about programs or films that I enjoy. 4. 1960s, if only to watch the country go through a massive cultural change away from the more traditional ways of life that had defined up to and still through that point. 5. The Super Mario Bros. movie. I know, it’s not a good film at all, but with what films do with computer generated images nowadays, I’d be interested in seeing how the film would look in this day and age, despite the campy look of the original. And given how the film has an ending that leaves the door open for a sequel, maybe we’d get some follow-up to where the story stopped. 6. On that note, video game films, I suppose, would be my guilty pleasure. There are some ones that I consider good, like the 1994 Street Fighter film or the original Mortal Kombat film, but many adaptations miss the point of the original game that I can’t help but watch them and, as a gamer, wonder what filmmakers missed. Especially when games are so cinematic right now that we hardly even need movie adaptations of video games. 7. Visiting Hong Kong again. Not that I wouldn’t want to visit other locations, but I enjoyed the night life of the city I visited and would want to spend more time exploring. 8. Video games have been my biggest ‘nerd’ or geek passion, but in addition: books, comics, television shows, and films, but I’m by no means an expert on any of them. 9. Working as an actual journalist or some media related profession, such as maybe an anchor or writer. That requires actual talent and writing prowess, though, so that will take some time to attain. That and having the right connections. 10. Lara Logan- There are a lot of journalists that I look up to, but Lara Logan is probably my favorite correspondent right now because of her no-nonsense attitude for telling the news and how deep in the thick of it she’s willing to go to tell a compelling story, regardless of the risks. That, I feel, is something many journalists should aspire to.